Two years, six artists, thirty gifts, one hundred eighty responses. 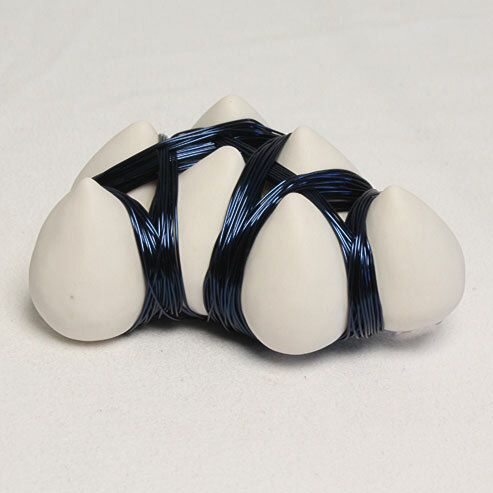 We are joined by our love of materials: porcelain, earthenware, found objects and other conventional and non-conventional sculptural materials. We are joined by our love of process: experimental and repetitive. We distinguish ourselves as individuals by our particular interests for exploration. We are separated by miles and distinct lives. When we began this project, like all long-distance-relationships, we were not sure how difficult it would be, agreeing to work together, depending upon each other, starting where someone else left off, sticking together and to a schedule. Over the past two years, objects arrived in the mail, sometimes inspiring, occasionally beautiful, and at times incomprehensible. We unpacked and unwrapped objects made from unfamiliar materials and someone elseâ€™s ideas. We responded, concocted, experimented, and allowed ourselves to fail in pursuit of uncertain and unknown breakthroughs. Following a predetermined map, we wrapped, packed and posted each response to the next robot. Awaiting responses, we were often met with the silence and distance of incomprehension all made worthwhile by fleeting connection. These connections proved to challenge, inspire, and provide substance for meaningful artistic expression. The results are a series of objects, which are both the voice of the individual and the collective.